When Auckland Choral Society – one of the most well-known choirs in the southern hemisphere – contacted me about the commission for composing a second orchestral suite after „Waves upon Waves“, the title „Space beyond Space” popped up immediately. Little did I know back then that this journey will take me together with my co-composer Johnny Bertl in unchartered territory. The original date for the performance was rescheduled from November 2018 to July 2018 and we had an enormous time pressure. Soon we discovered, that only if we allow space to embrace us against all external timelines would we be able to come up with something groundbreaking. We thought about how we could make “Space beyond Space” a direct experience for the audience. We turned to lyrics around space. But because there are no lyrics in Latin expressing space we needed to let it come out of our meditation which was composing. „Ubi nihil est – Ibi omnia sunt“ was the first revelation that we decided to let the choir recite in the very beginning, supported by a primordial drumbeat: „where there is nothing – there is everything“. Walking through New Zealands pristine nature, one is constantly surrounded by space. Luckily we could take time to let the music resonate in us before we performed it in a world premiere at Auckland Town Hall. Space – What a mysterious phenomenon! It is the only thing that connects everything with everything. But how difficult it is to grasp: looking into the night sky in New Zealand, myriads of stars are shining their light, attracting our attention. But how to get into the intervals, into the „nothing“, where there is everything? That time helped us to rearrange some parts, especially as we knew that this multilayered polyrhythmic music of „Space beyond Space“ has never been manifested before with more than 200 musicians on stage. How will they react to this challenge? How will our conductor Uwe Grodd manage to craft a sounding unity out of so many different rhythmic layers? Our curiosity about the experiences in the first rehearsal kept rising. The first time when all 230 musicians played together was sobering. A choir piece in which the singers are carried by a different rhythm than the orchestra and the percussion can either be totally thrilling or merely horrible. Johnny and I looked at each other in perplexity. We just experienced the result of the fact that in music education no one learns to merge the two components of music: the audible and the tangible space in which everything is occurring. And because this space is not conveyed, musicians helplessly start to count which makes rhythmic orientation even more impossible. The TaKeTiNa process is the first and sofar the only method, that provides participants with a physical and real experience of the background in which music happens, therefore enabling an extraordinary sense for rhythmic orientation. We looked at our conductor Uwe Grodd who seemed astonishingly calm as he moved through the different movements of the orchestral suite. 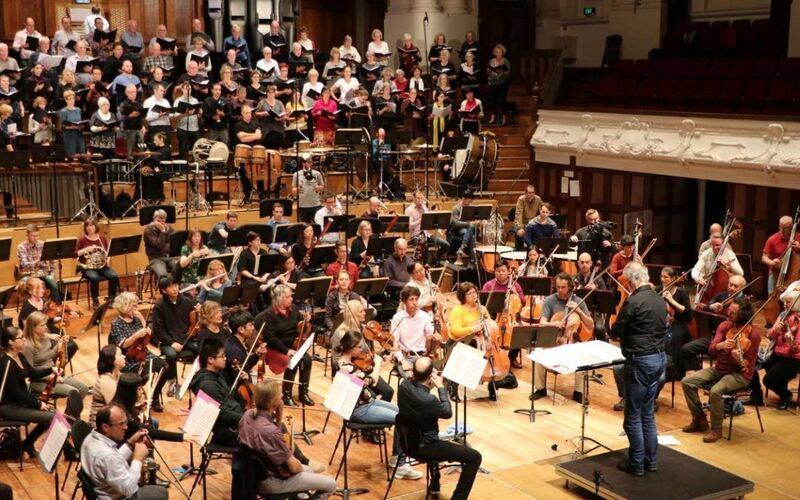 Since the rhythmic uncertainties remained present even for the phantastic musicians of Auckland Philharmonia and Auckand Choral Society until the very end of the rehearsal, we were not sure if performing this composition in Auckland Town Hall two days later would be a good idea. Rehearsing with a huge orchestra has its own rules! Even if something does not work out, there is literally no chance for rehearsing longer. Even five minutes longer would entail substantial financial consequences. So the pressure was really on. Gradually we started to understand the strategy of Uwe Grodd: first he gave the musicians an overview over the many layers of our work. Then, as a team, we analysed the reasons why at certain places the music did not come together. In the first rehearsal we crafted a map which Uwe executed now in the second rehearsal: just asking the strings with the marimba to slowly manifest the rhythmic tension against the oboes, flutes and horns. There it was all of a sudden – it locked! And not only did Uwe rehearse in extremely slow tempo but also he radiated the feeling of space – with all the time pressure running in the background. The different parts of the music started to click and smiles came into the faces of the players. „That is really new music“ someone stated in the stillness after the last tone. All we had were two and a half rehearsals with everyone involved. Yes, a lot of difficult parts have worked in the second rehearsal, but would they work in the moment, when the audience gets to hear it for the first time? As soon as the concert began, there it was again: the simultaneity of tension and deep spaciousness. And as the „Prologue“, the first movement, started to sound, there was all of a sudden a feeling of ritual, of something larger taking over. The sound of the huge organ together with the choir and the orchestra was an overwhelming sound experience. But unlike amplified music the intensity was smooth at the same time. In the last sequence of the concert, everyone became part of a huge rhythm generator and stopped in a guided unity on the last beat – only the choir sounded pianissimo: omnia – omnia – omnia, like a spaceship drifting away – then there was an intense moment of stillness of space before the audience reacted with screaming and stomping for minutes. Was this the case because we played so well? No, it happened, because the audience was moved to their core and needed to express this intensity. Now we are working on the video, that we hope will convey the „Space experience“ for everyone who could not be there at this unique moment of „Space beyond Space“.